Decks get all the glory, but trucks make skateboarding possible. They enable skateboarders to turn smoothly and sharply with just a slight lean. Your trucks are not just for steering, though. The best skate trucks can take the bludgeoning that skaters give them and keep on grinding and turning. Like any other skateboard component, all trucks are not equal. There are many small differences between brands and models. Some of those differences affect performance and some are more cosmetic. Part of the fun in skateboarding is trying different components and finding what you like. We’ll help you narrow down your options, but first we’ll look at the parts of a skateboard truck. The hanger is where the business happens during grinds. It’s the molded (sometimes forged) aluminum part that hangs off the skateboard. 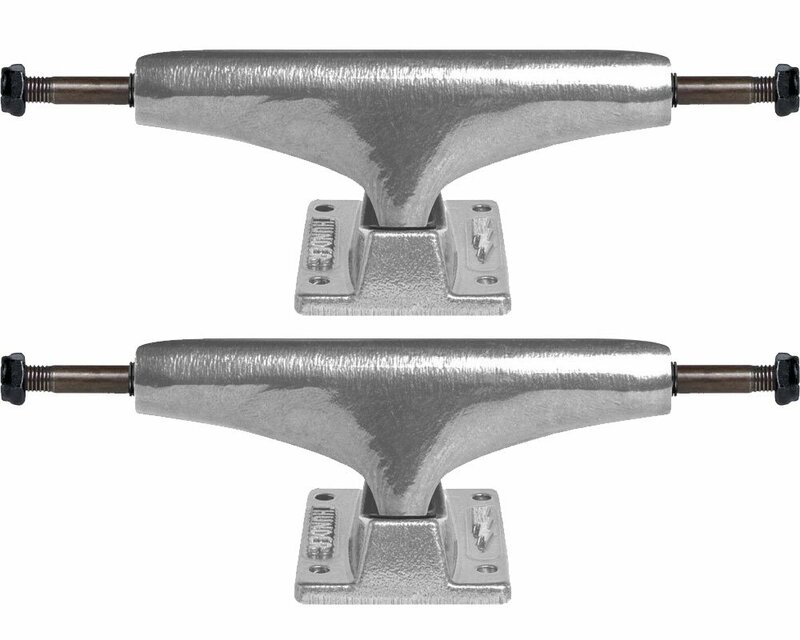 The quality of the aluminum in a hanger will determine the feel and quality of the grind when skaters ride on this part on obstacles. All well-known and reputable brands use quality materials for their hangers, but there are slight differences that lead skaters to prefer one of another. The hanger connects to the deck at the baseplate. The baseplate is the flat aluminum piece that bolts onto the board. The hanger connects to the baseplate at two points. When skateboarders lean to turn, the tilting of the deck causes the hanger to pivot around the axis between these points for precise steering. One attachment point is the pivot, which is an aluminum protrusion that sits in a cup (pivot cup) on the baseplate. The other point is the kingpin. The kingpin is a hardened-steel bolt that passes through and connects the baseplate and the hanger. It is threaded on one end to allow it to be tightened or loosened, which makes it harder or easier to turn, respectively. Modern kingpins are sometimes hollow, meaning the manufacturer drilled a hole through the bolt lengthwise to reduce its weight. Tightening the kingpin applies pressure to a pair of urethane bushings, which stabilizes a skateboard but makes it harder to turn as well. The hanger has a hole through which the kingpin passes. That hole is flatter in the middle to make seats for the bushings: urethane cylinders that provide cushioning and snapback when turning a skateboard. Like the urethane wheel, bushings vary in hardness and shape. Softer bushings turn more easily, while harder ones are more stable. The stability aids skaters when jumping off big staircases and other large obstacles. Skateboarding bushings come in two main shapes: barrel and cone. Normally, the top cone (closest to the ground) will be a cone and the bottom (nearest the board) one will be a barrel. Sometimes manufacturers use a double-cone setup to make turning snappier. Double-barrel setups are extremely stable, but are far more common in longboarding than skateboarding. The first consideration is the type of skateboarding you will be doing. Manufacturers often make low trucks, for example, specifically for technical street skating. The lower center of gravity is intended to make the board flip and spin easier. High trucks are intended for transition skating, but are common on street setups. The materials in trucks make a huge difference, but modern trucks are pretty homogenous. It is hard to find a real flaw in any of the respected brands on the market, as they have all had the benefit of years of experience and trial-and-error improvement. The one mistake new skateboarders often make is choosing the wrong size trucks for their board. In general, the width of the axle should be within ½ inch of the board’s width. An exact match is best, but there is wiggle room in the margin of error. When the axle is too short for the board width, the setup will turn tighter than a rider expects based on the board width. It is not wrong, and you can adjust to it, but it looks wrong. The same goes for too-wide trucks. Manufacturers often use a metric measurement to differentiate their trucks, which is almost always the width of the aluminum hanger. They tend to give the axle measurement in inches in the U.S. Use the axle measurement to determine size, and stick to the ½-inch rule for a symmetrical truck fitment. 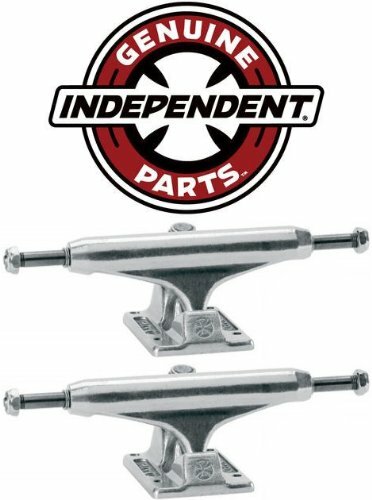 Independent released its Stage 1 trucks — its first-ever model — in 1978. Since that time, Indy has grown into the most popular and well-known truck manufacturer. The company’s tradition of quality and buttery grinds continues with its Stage 11 trucks. Despite rumors to the contrary, Indy’s are still made in the U.S. The Stage 11s feature a reworked and tighter-turning geometry. They are more stable than the previous Stage 10 trucks, which also suffered from a tendency of the grade-8 kingpin to bind on top bushing in turns. Stage 11s feature Indy’s 90A (medium-hardness) bushings in a cone-and-barrel configuration and a no-hangup bushing seat. Riders with boards around 8 inches wide should consider the Stage 11 139mm. Smaller boards will require 129mm, while boards above 8.5 inches require 149mm. Independent’s popularity never seems to wane. It spans generations of skaters. Just watch this Indy promo video. Look at that cross section of terrain and riders. There is a reason so many different types of skaters ride Independent trucks. Once they feel that silky Indy grind, they compare every other truck to it for life. The Polished 147 Hi is one of Thunder’s best sellers. It comes with 8-inch axles, which are perfect for boards between 7.9 and 8.12 inches wide. The Thunder 149 will suit wider boards and is equally popular. The Hi versions set the axle slightly further from the deck, but the Lo’s are only slightly closer. Riders who use wheels large than 52mm should consider the Hi’s. Thunder polished trucks may not seem to stand out, but their performance grabs attention. These things grind like a dream. Any truck will grind if you lean back far enough and go fast enough, but Thunders break into grinds with the absolute minimum of effort. They sound sweet and they turn in razor sharp, but there is a tradeoff for that agility. Thunders will only get so tight with their stock bushings. Some skaters may find they require harder bushings for stability if seriously fast transition skating is on the agenda. The bushings are truly the only issue with a set of Thunder polished trucks. They are utilitarian and mushy. They will work, but an upgrade in clouds brings a set of Thunders to life. The geometry is addictive. Once riders adjust to the slicing action of turns on Thunders, they often can’t skate street on anything else. Tight turning is not just good for carving. Check out Walker Ryan’s Thunder promo video. When he lands sideways and rolls away clean, that’s because of turning radius. In 1992, street skateboarding grew up. It was in that year that Venture revolutionized street skating when it released the Featherlight truck. Since the time Venture charged into skateboarding and legitimized street skating with the first street truck, the venerable company has seen quite a few overhauls. Some things never change, though. Ventures are still made with street skating in mind, and they are still made in the U.S.A. The Venture 5.0 Hi Polished Truck are the company’s workhorse. They retain the V-shaped relief on the polished aluminum hangers, and the light, polished-aluminum base plates reduce weight as they always have. Venture is now a sister brand of Thunder, as the two are both operated by super-distributor Deluxe. That isn’t a bad thing, though, as there is no marked difference between the sweet-grinding aluminum in either truck. Ventures have a neutral steering radius: their turn in is neither too tight nor too loose. The Goldilocks analogies don’t stop there. The Hi’s are not so much tall as they are standard height. The Venture polished Low’s are just exceedingly low in comparison, and are meant for the most technical skaters. The Venture Hi’s are the right height to keep wheel bite out of the equation and to enable responsive and quick turning. Skateboarding guru and Hall of Fame candidate Rodney Mullen started Tensor in 2000, and from the beginning he was determined to do his own thing. As a technical skater who places pressure all around the deck surface for different tricks, Mullen wanted trucks that would let him do his thing without turning and veering off line. Tensor trucks have a geometry diametrically opposed to that of most other skateboarding trucks: they are remarkably stable. Tensors come in aluminum or magnesium construction, but the Tensor Magnesiums are the company’s most interesting product. Magnesium is lighter and stronger than aluminum, and Tensor claims weight savings of 25-percent over its aluminum competition. 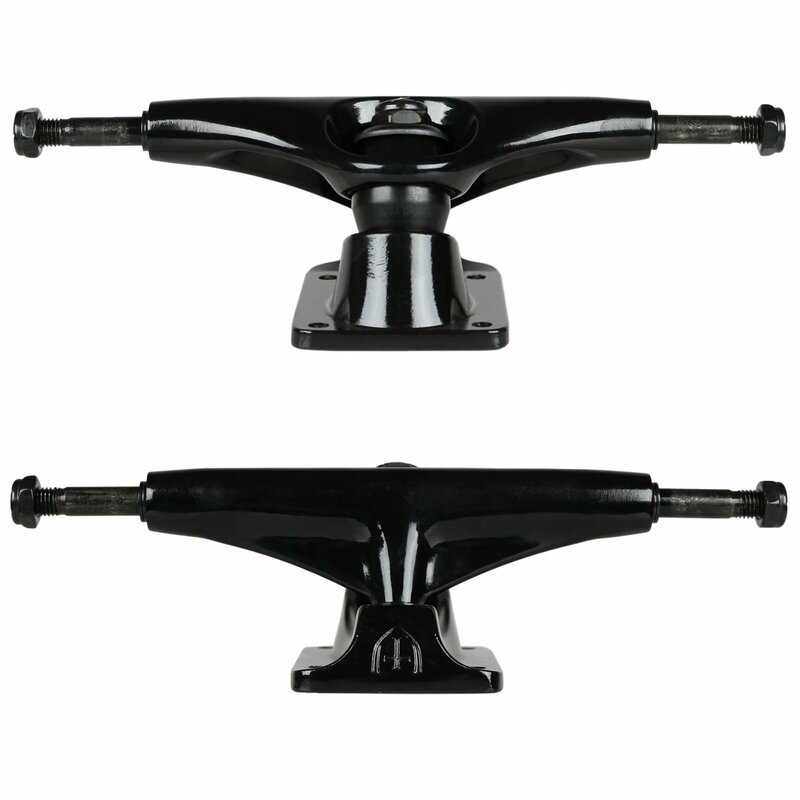 Tensor trucks also feature protruding nubs on their baseplates that dig into the deck to keep the truck from sliding around, as well as unique, interlocking bushings meant to prevent wheel bite. Tensors’ lack of dive-in on turns is off-putting to some skaters, while others appreciate the stability. Watch Zered Basset tear it up on his Tensors. He’s turning just fine. A change to conventional bushings improves Tensors’ turning, but the extremely steep kingpin angle is the real culprit and is unchangeable. The lightness of magnesium becomes immediately evident to those who have never ridden them, though, and boards with aluminum trucks seem excessively heavy to skaters who use them for a while. Off course, trucks need not be meant for the rigors of high-level street skating to be worth a look. 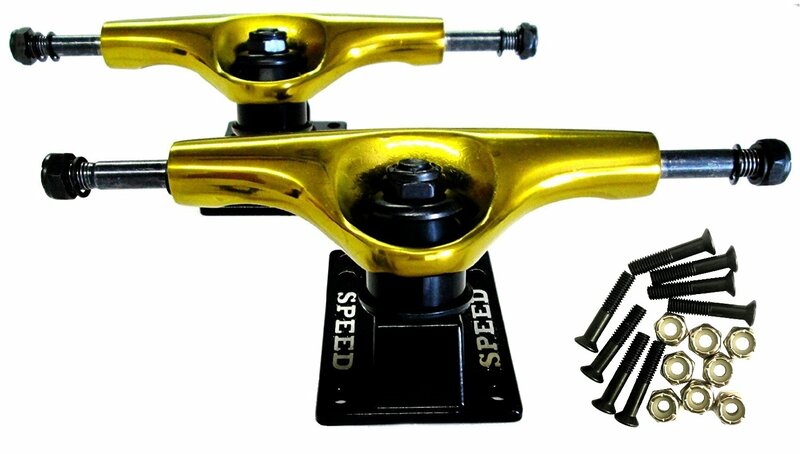 Speed Trucks offer a similar design and construction to most of the best skateboarding trucks available, but they offer considerable savings to the skater on a budget. The 5-inch Speed Trucks have 7.63-inch axles, which match up to the 7.5- to 7.75-inch boards young beginners prefer. They have a mid-height profile for all-around performance, and have an eye-catching metallic finish. In an uncommon move, the manufacturer includes a set of 1-inch mounting hardware with the trucks. Speed trucks are reliable, and they steer true. Beginning skateboarders will not likely know a difference between them and the big brands. The savings can go toward something they will notice, like a better board. By the time beginners notice any shortcomings, the Speed trucks will be worn out anyway, and they can get better trucks when they can grind them. So What Are The Best Skateboard Trucks? Indy managed to improve upon a classic yet again with this update, fixing the flaws it introduced to the line with the Stage 10 and securing its reputation for another generation or so. Every skater is practically obligated to skate at least one set of Indy’s, and the Stage 11 is a great introduction to the brand.